The store opened in 1900, the same year as the Mt. Washington branch of the Carnegie Library of Pittsburgh. The store carried clothing, toys and household goods and much more! Do you remember S&H Green Stamps? Ad from 1906 for Skirboll’s Variety store. Furs were definitely in vogue during that time. Skirboll’s closed their doors in 1982. This was the mailer that they sent out to their customers during their going out of business sale. It was bright yellow. What do you remember about Skirboll’s Variety store? As the whole city of Pittsburgh continues to grieve for the lives lost during the Tree of Life shooting that occurred on October 27, 2018, neighbors across the city have been coming together with strong and united messages of peace and hope. On Friday, November 16, 2018, the Neighbors on the Mount and many local businesses will kick off the holiday season with Light Up The Mount. The theme for this community event will be Peace. St. Mary of the Mount choir will be performing. Santa will appear at the Park to light up the park lights and will then visit with the kids at Redbeard’s Bar and Grill. Free photos with Santa will be available. Jennifer’s Hair Studio will be doing free hair braiding for kids at Redbeard’s during the event. The Micro Diner will be providing free hot chocolate during the event. Niko’s (Café Niko’s) will be providing free soup and a fun area for children to hulu hoop and play during the event. Coughlin’s Law Kitchen & Ale House is hosting a “Create your own ornament” for the kids to be placed on the Coughlin’s Law Christmas Tree. The Neighbors on the Mount will be handing out candy canes for the kids during the event. The Neighbors on the Mount hosted a tent for the Mount Washington Community Development Corporation’s 2nd Annual Block Party on September 22nd. The MWCDC hosted a great community party with good food, good drinks and great entertainment on Grandview Avenue. Thanks to Mike Carlin, the Neighbors on the Mount sponsors several community clean-up projects throughout the year. The latest was the Fall Community Clean-up that was held on Saturday October 6th. About 10 great neighbors spent the morning cleaning up Grandview, Wyoming, Virginia, and Shiloh with a few other places in between. 13 large garbage bags were filled during the clean-up event. On Sunday October 21st, the 3rd Annual Trunk or Treat was sponsored by the Grandview Lions Club. This new holiday tradition has become one of the most popular events of the year. 20+ neighbors and local businesses set up in the St. Mary of the Mount parking lot for kids to enjoy a day-time trick or treating experience. The Grandview Lions Club provided pumpkins for all of the kids to decorate. The Carnegie Library of Pittsburgh’s Mt. Washington branch provided the supplies for decorating the pumpkins. The Neighbors of the Mount had hot chocolate available for the trunk and treat event. Next up is the planning for a community celebration for the holiday season on The Mount. The Neighbors on the Mount decorated the Fireman’s Park on Shiloh Street on November 4th. A community light up night will be celebrated on Friday, November 16th. Save the date! Light Up Night on the Mount! Friday November 16, 2018. On Saturday, July 14th, the Neighbors on the Mount held another community clean-up project. This time the intersection of Boggs/Warrington/Rt. 51 was cleaned up and 13 big bags of trash and litter were collected thanks to Mike Carlin, Monica Diel, Mark Benny, and Linda and Kevin Reber. The next community clean-up is scheduled for Saturday, July 28, 2018. This clean-up project will focus on the Fireman’s Parklet on Shiloh Street from 8:30 am to 12:00 pm. This project will include a litter pick-up and a weeding of the green space in the park. Gloves, Trash Bags and refreshments will be provided to all volunteers. The Neighbors on the Mount are always looking for more volunteers for the community clean-up projects. More hands means that more clean-up work can be accomplished in a shorter amount of time! If you are not able to help physically with the clean-ups, but you still want to help out, we could use some volunteers for some lighter tasks, such as handing out refreshments at the end of a clean-up project. 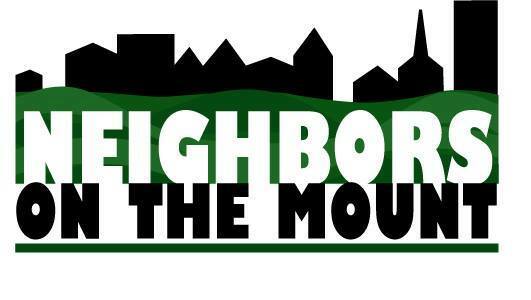 To volunteer for light duty for the clean-up projects, contact Marian Streiff (streiffm@neighborsonthemount.org). Sponsored by the Grandview Lions Club and Councilwoman Theresa Kail-Smith. More details to come. The Carnegie Library of Pittsburgh–Mt. Washington will host an Art Table during the picnic.